Change is the law of life. Or so said John F. Kennedy. The workplace, like all other environments, is subject to change over time. The responsibilities, compensation and many other aspects of your job rarely remain static, especially in today’s fast-paced and technology-driven economy. Dynamic external market factors mean employers must continuously evolve their company in ways that may affect their employees. While employees must remain adaptable to developments in the workplace, not all changes – particularly those that are sudden and dramatic – must be accepted. Indeed, when changes in the workplace fundamentally alter the terms of employment, an employee may have the right to claim constructive dismissal. 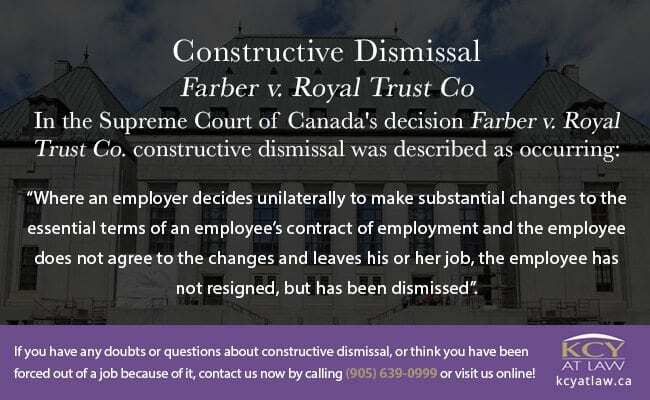 Constructive Dismissal – Farber v. Royal Trust Co.
That is, when an employer makes significant and sudden alterations to an employee’s terms of employment, the employee may be in the position to treat their contract as having been terminated. In the case of constructive dismissal, an employee’s resignation from the company may be considered a dismissal, entitling the employee to a severance package the same as if they had been terminated without cause. However, determining if the changes made to your terms of employment constitute a constructive dismissal can be complicated. Constructive dismissal cases are time sensitive and dealt with on a case by case basis with the onus on the employee to demonstrate their employer’s failure to meet their contractual obligations. Claiming constructive dismissal carries a degree of risk, especially since there is no guarantee of compensation once you have left your position. Therefore, you should seek legal advice from an experienced employment lawyer to discuss your situation before quitting an untenable position. KCY at LAW have the expertise to help both employers and employees navigate their rights in today’s dynamic work environment. If your workplace is undergoing a transition, contact us to ensure your contract is being upheld or to help you properly transition your team. Call us at (905) 639-0999 or reach us online to arrange for a consultation. Injured In An Accident? You May Have A Brain Injury! Can You Sue The Good Samaritan?